Give your pal the beauty sleep he needs with the FurHaven Ultra Plush Oval Dog & Cat Bed. Designed for pets who like to curl-up in comfort, this oval-shaped, nest-style bed features comfy walls to support your pal’s hips and back, a tufted, fiber-filled insert pillow cushion, and an ultra-soft surface. Your pal will nap and snooze happy with its snuggle-friendly design and step-in cut out that makes it easy for him to get in and out. And cleaning it is a cinch―just remove and machine wash the zippered cover, and hand-wash the foam core. You can also take out the insert pillow for easy, daily clean-up as often as you need. Plus, it’s available in different colors and sizes to find the go-to bed for your pet. Nest-style bed provides a comfy place for your kitty or doggy to nap, lounge, and snooze. Features comfy walls for support, a tufted, fiber-filled pillow cushion, and ultra-soft surface. Front cutout makes it easy for disabled or elderly pups to get in and out as they please. Removable pillow, machine-washable foam wall cover, and hand-washable foam core for easy clean-up. Available in different colors and sizes to find the go-to bed for your pet. Cover is machine washable, line dry. Foam is spot clean only, do not wring. It's super soft and cozy but maybe better for a cat than a dog. The bottom piece is actually a separate cushion, Sevens removed his right before he murdered the rest of the bed. To be fair, he still uses the bottom cushion for sunbathing in the back yard. This bed looks ultra comfy and soft, but after having it for one week, the seam ripped and the dogs started pulling stuffing out. My dogs are not chewers and don't dig in the beds. They destroyed this bed in minutes. Also, the insert is not attached to the bed and slips around in and out of the oval. I was not happy with this bed at all! Kitty was just not interested. Don't get me wrong my cat loves to lay and soft beds and this one is super soft I'm sure any other cat would probably like it. It would also be a perfect bed for a small dog. For some reason my kitty likes beds that are more enclosed that way she can hide. I ended up donating this bed to the local animal shelter so some little kitty, or small dog will have a warm, soft bed to sleep in. They are plush, they are very soft and they are attractive. At present they are kept in front of our gas fireplace and both our Yorkies spend these cold, damp north Texas days in cushy, warm comfort. When my critters are happy, I am happy. Thank you. Beautiful and so soft for my furbaby Abby, my kitty immediately got in the bed and snuggled in the softness. Finally, I thought to myself. 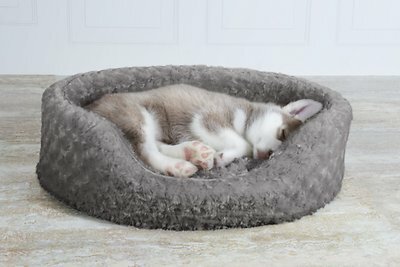 I found the perfect pet bed. It's beautiful, plush, and has a removable cover. All true, except I thought the middle part had a removable cover too. But it doesn't. And upon washing, it exploded inside my washer. The instructions stated: machine washable. So disappointed. This bed would be beyond PERFECT. If the cushion in the middle had a "removable cover" as well. Such a shame. 80# dog + extra large bed = peace in the land. The bed looks small, but our dog likes to curl up and it fits him perfectly. I’m amazed by how much he LOVES this bed.